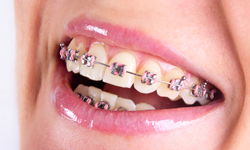 Traditional metal braces are the most common type, and are more comfortable than ever. Made of high-grade stainless steel, they straighten your teeth using metal brackets and archwires. With metal braces, you have the option of adding colored elastics (rubber bands) for a more unique and colorful smile. Invisalign® uses a series of invisible, removable, and comfortable aligners to straighten your teeth. And no one can tell you are wearing Invisalign because it’s invisible! Not only are the aligners invisible, they are removable, so you can eat and drink what you want while in treatment; plus, brushing and flossing are less of a hassle. The aligners are comfortable and contain no metal to cause mouth abrasions during treatment. Please visit our Invisalign page to learn more. Lingual braces are hidden behind the teeth and are therefore “invisible” when you smile. Lingual braces are 100% customized to match the shape of your teeth; the metal appliances are created uniquely for you. Lingual braces are a reasonable option for athletes, models, actors/actresses, musicians who play wind instruments, and adult professionals.